Did you watch The Bachelor last night? I wish we could all watch it together! I hate that AshLee had to go in a scary cave to show that she "trusts" Sean. And I really hated that Lindsay had to eat a bug to prove that she is adventurous! Bug eating and cave dwelling do not make a good wife! In fact, I think I would be more attracted to a person that doesn't eat bugs! I'm pretty sure that would be on my list of non-negotiables! That happens to be my opinion though. And ABC never did ask for my input. This year has seemed more like Fear Factor than The Bachelor! I will say that I think Sean is great and I hope he finds true love. I am optimistic...I always am! With the exception of Jake and Vienna. Last night I was a little annoyed that the girls didn't just say "NO". "No thank you, I don't really fancy bugs." 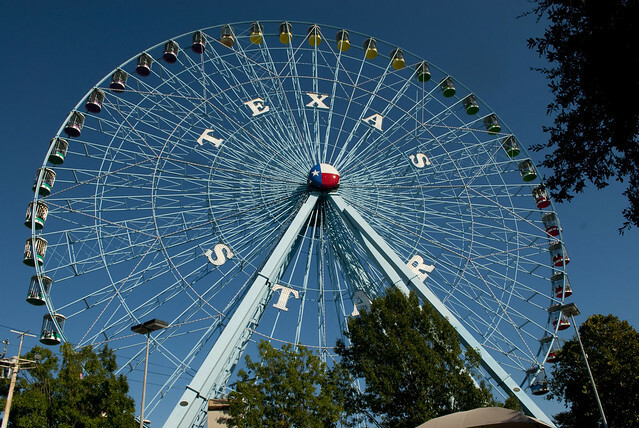 Then I remembered the Ferris wheel at the Texas State Fair. The TALLEST Ferris wheel in all the land. When Marcus and I were newly dating. We went to the State Fair. He really wanted to ride the Ferris wheel. (The Tallest One in America!) And I really. really like to be as close to the ground as possible. That's probably why God made me so short. I am terrified of heights. BUT, I didn't have a ring on my finger yet and that makes you do dumb things. Soooo, I obliged and rode the Ferris wheel. It was real romantic, because we were in a gondola with another couple? AND I nearly died from fear! For reals! The people kept asking if I was OK, can she breathe, what's the matter with her, are you sure she's OK?! My blood pressure is going up just thinking about it! Thankfully I was still marriage material, even though I am not a dare devil...or a bug eater! My first date with my husband was a 5K! HA! I am the opposite of a runner. I was dying the whole time trying to look cool like I ran all the time! Laughable now because my husband figured me out. Girls are so DUMB for boys! I'm glad I said yes to a 5K though. I think it worked out.